The Cwtch provides the peace and tranquillity of the country side, close to a beautiful coastline. Property 51: The Cwtch provides the peace and tranquillity of the country side, close to a beautiful coastline. Sea Views, South Wales. Holiday Destination or Romantic Escape. Property 58: Sea Views, South Wales. Holiday Destination or Romantic Escape. Property 60: Nos Da is a contemporary cottage sleeping four offering the ideal tranquil escape in South Wales. Situated at Nash Point Lighthouse, Stella provides accommodation for up to five guests. Property 66: Situated at Nash Point Lighthouse, Stella provides accommodation for up to five guests. Ariel a lighthouse keepers cottage with accommodation for up to five guests. Property 74: Ariel a lighthouse keepers cottage with accommodation for up to five guests. 2 bed cottage near Swansea Beaches and Brecon Beacons - dogs stay for free! Property 89: 2 bed cottage near Swansea Beaches and Brecon Beacons - dogs stay for free! 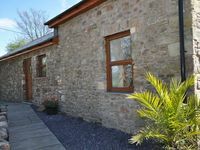 LLWYNAU FARM PINELODGES - CASTELLAU, LLANTRISANT - ONLY 12 MILES FROM CARDIFF. Property 91: LLWYNAU FARM PINELODGES - CASTELLAU, LLANTRISANT - ONLY 12 MILES FROM CARDIFF. The cottage was a great choice for the area. It had everything we needed. The king-size bed was most welcome. Old stone cottages tastefully restored; interior is new and decorated well. Owners have provided a large tv which is nice for evenings. Location near pubs, access to Nature Preserve, nearby coastal walks, historical sites. Owners Helen and Steve left a Welcome Pack and were helpful and friendly, making for a really good week.